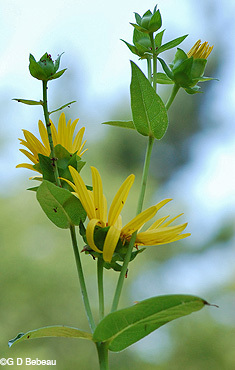 The Eloise Butler Wildflower Garden contains four species of the genus Silphium. All are sun-loving, yellow flowered plants of the Upland Garden and are among the tallest flowers in late summer and autumn. These four are Compass Plant, Silphium laciniatum L., Cup Plant, Silphium perfoliatum L., Prairie Rosinweed, AKA Prairie Dock, Silphium terebinthinaceum Jacq. and Wholeleaf Rosinweed, Silphium integrifolium Michx. The genus name, Silphium, is from a plant appearing on ancient Greek coins of the city of Cyrene. This was an ancient plant of North Africa that was named in Greek - “silphion” - and was said to have resinous juice that was medicinally sought after. 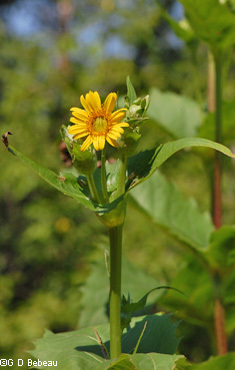 A common name applied to many Silphiums is “Rosinweed”, again, due to the resin, but as we shall see, we have one Silphium to which that specific common name attaches. Even though these four are all yellow-ray flowers with a central disk, they are still easily identifiable - particularly by their leaves, which are all distinct. As you can see from this table these plants are tall, with Prairie Dock being the tallest flowering plant in the Upland Garden. Here are the specifics on each plant. 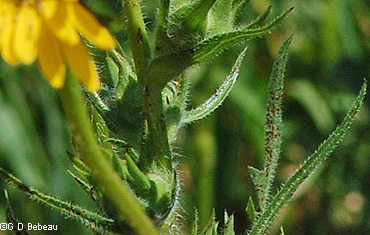 Compass Plant: The flowers appear in several heads in long branched clusters. The common name comes from the tendency of the large lower leaves to be somewhat upright with the edges aligned in a north-south direction. As this plant inhabits the central United States, this fact allowed the early settlers crossing the prairies to use the plant as a sort of rough compass. The leaves are very deeply pinnately-divided which makes it entirely different from the others, and that is the source of the species name, laciniatum, which is from the Latin meaning “slashed” or “torn into divisions”. Cup Plant: There can be several flower heads in a branched cluster. The stems are square in cross-section and smooth. Besides the height, the key feature is the opposite leaf pairs that surround the stem, appearing to be pierced by it, and forming a cup around the stem - hence the common name. 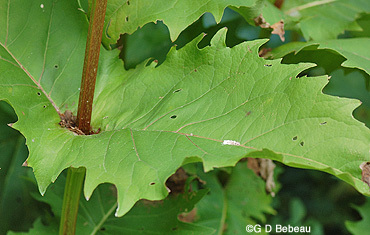 The species name, perfoliatum, actually means "through the leaf," referring to the stem piercing the leaf. These cups easily collect water and are a source of liquid for birds and, as Eloise Butler suggested, the water may form a barrier that insects cannot cross when trying to reach the nectar of the flower. The plant has an extensive root system and does not transplant well except when very young. 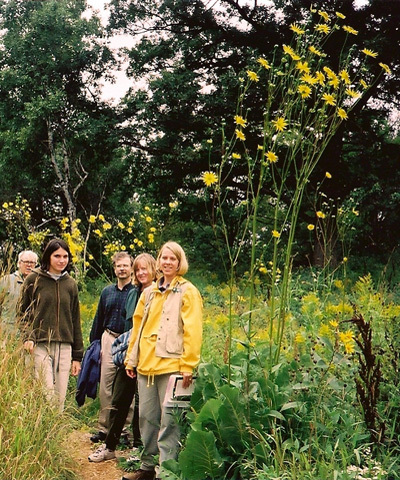 Prairie Rosinweed (Prairie Dock): Growing from 4 to 10 feet high, this is the tallest of the four and the tallest flower in the Upland Garden. It has numerous flower heads on otherwise bare stems, the leaves being (most always) entirely basal - and quite large. They are hard to miss, with the triangular shape, heart shaped base, and large coarse teeth. The species name, terebinthinaceum, means "like turpentine." which may refer to the aroma of the resinous juice. Prairie Dock is the last of the four Silphiums to bloom, usually not until late August before any quantity of bloom is seen. The tall stems provide some vertical visual relief during the winter months. Wholeleaf Rosinweed: This, the shortest of the four Silphiums, is the one you are most likely to encounter in a large clump. It is also the earliest of the four to bloom, usually showing open flowers in late July. There are usually a number of branched flower clusters at the top of the stem. 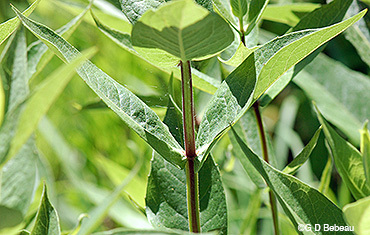 The species name, integrifolium, is Latin for "entire-leaved" referring perhaps, to the many leaves that cover the stems. It can also refer to the leaf itself as being “entire”, that is, without teeth, but Rosinweed leaves have very tiny teeth. 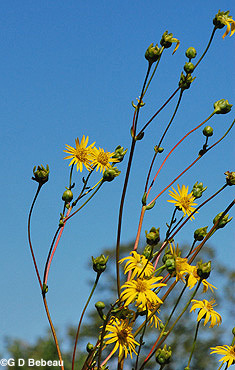 “Rosinweed” as a generic name has been used to refer to all Silphiums. Native Status and Garden History: The Upland Garden was made a part of the Eloise Butler Wildflower Garden in 1944, thanks to the efforts of Martha Crone and Clinton Odell. When Martha Crone completed her 1951 inventory of all plants in the Garden, three of four Silphiums were present. Rosinweed was not on her list although she had planted it in 1939 and sowed seeds in 1944. Of the four, only two are native to Minnesota. 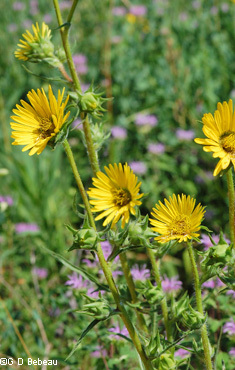 Cup Plant and Compass Plant are native. Cup Plant was first planted by Eloise Butler in 1907 and Compass Plant in 1913. 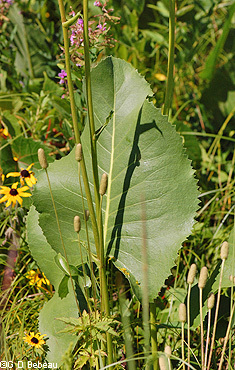 Prairie Dock is a plant of the east central United States, not found further west than Iowa, Missouri and Arkansas. It was introduced by Martha Crone in 1939 and planted again in 1951 and '55. Rosinweed is reported to be native to parts of Minnesota in certain literature but the Minnesota DNR (Ref. #28b) and the U of M Herbarium (Ref.#28c) maintain the plant is not native; however, it is native to much of the Central United States. Medicinal Lore: Of the four, only Cup Plant, S. perfoliatum, has any reference in Grieve (Ref.#7) and Hutchins (Ref.#12). All refer to the use of the root as a medicinal ingredient and give formulas and dosages. The root was used as a tonic, diaphoretic (stimulates perspiration) and diuretic. Densmore (Ref. #5) has, from her Minnesota Chippewa research, perhaps the most information as she lists usage by the Chippewa for lung ailments, hemorrhage and joint pain. Here are leaf images of the 4 plants. An autumn photo in the Upland Garden showing the relative size of Prairie Dock. References: This report was compiled from many sources, all of which, including those specifically named above, are detailed on our Reference List. Text and photos by Gary Bebeau or ©Friends of the Wild Flower Garden, Inc. . More photos of each plant and more detailed plant information will be found in the "Site Plan/Archive" or can be accessed by clicking the active links above.